As far as I can tell, nothing like this has been posted here before. I could be wrong, there is just SO MUCH stuff here it is very possible it got by me. If it got by anybody else, well here it is again. I had never heard of these, it was wife that pointed me towards them. Somehow she knew about them and asked me to look into it. Well, I did and ordered a couple. They came in about a week for Christmas and I must say, they exceeded my expectations. After I saw how well they worked, I went out and found a used light fixture for it. Looks great, especially in an old fixture. I’ve got one from Utorch on the way – from GB. It looks pretty cool for the price… Not sure what i’m gonna do with it or if i’ll order more. I could certainly swap all my outdoor lights for those, but i don’t think they put out much useful light. I’ll see when i get it. In a promo email i got today from GB or BG there are half a dozen such lights from different brands and about the same price ($6). Some seem to have some sort of flame like filaments inside… Not sure. The one i ordered doesn’t seem to have those – or maybe the picts have been doctored. Wow, those are neat! Thank you for sharing! Your link isn’t showing. Can you post it again? Does your bulb’s effect resemble any of the five featured in the video I shared? Can you add a link to where you purchased them ?? That was my biggest fear as I ordered mine. I tried to get the same one BigClive had. It seems I was able to do that. As is usually the case, other companies come out with clones that may or may not work as well. The ones I recieved not show individual LED’s. They are diffused enough that they can not be seen. Here is the link again. Even so, there is no guarantee you will receive stock I did. Things change, the price already has……….. In other words, they no longer sell the same exact item that I received. More and more I have come to realize that it is just about impossible to know what I will get when I order something on eBay. I just spent 2 months trying to get a low profile (half height) USB3.0 card. First time I ordered the low profile from TomTop but received a full height card. They apologized and refunded me. Then I ordered the same card from another vendor and received the same wrong card, fulfilled by TomTop. Got another refund and now 2 months later I still don’t have the low profile card I need. I ordered a pair just for s&g. Check the “gearbest official deals” thread (which I don’t have handy, erm). BG had/has a sale for, again, a flame-bulb for 7.50, and others for >10bux. Already deleted the email “flyer”, but try goggling it. That’s the one i ordered but have yet to receive. If the transparent part can be unscrewed or otherwise taken apart you may be able to tape some tracing/transfer paper inside. You can also try to ‘frost’ it with sand paper… Now if you use the light inside an appliance where you dont see the bulb directly it would not matter much. Here are some pics of the actual bulb and the box it came in. It was the 6.5W version. Notice the vent holes. I was lucky also in that this bulb has the “break away” as described the comparison video posted here. Here is a short video shot against an open window during the day. With my cell phone it was the only way I could get a video of how the effect looks in real life. Very cool! Ima have to order some of these. Thanks for posting, very informative. The transparent part does not unscrew. Is it glued? How do I forcibly open it. I tried the tracing paper on the outside, it did not work. That last video was very helpful, and a nifty handyman should be able to create some kind of additional diffusion if required in a bulb. 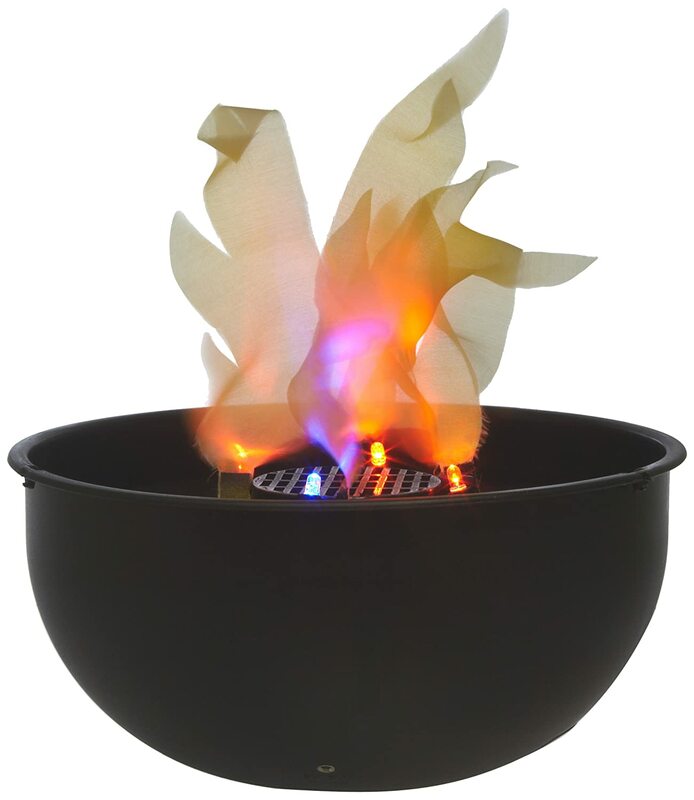 I have seen a “flame bulb” in our local garden store and it, albeit diffused properly, didn’t look like an actual flame at all. There wasn’t enough “randomness” and “warmth” a natural flame would give. Also wasn’t very bright. I wouldn’t be interested in paying 6-7 bucks for something unrealistic and low-lumen. Wishing for a GROUP BUY from a dedicated vendor that can provide what we really want in a flicker flame bulb. Dchomac,yours looks really nice. Would make perfect GroupBuy? I ordered one weeks ago, intended it for a Christmas present but it still hasn’t arrived. Was hoping it would be as advertised, paid about $20 for it and didn’t know it was out there at so many other places. As I noted above, I’m not that confident that I would get the same bulbs second time around. I opened the transparent part. Tried diffusing with tissue paper and tracing paper. Neither worked. The LED’s are still clearly visible. Any ideas? As someone mentioned, the problem is the LED’s are too close to the diffuser. From a distance, say, in an outside light, unless you’re a red-tailed hawk or something, I doubt you’d be able to distinguish individual LEDs. Maybe instead of wrapping the inside with paper and the like, a thin layer of cotton “fuzz” around the outside might diffuse the light a little more without too much light loss. 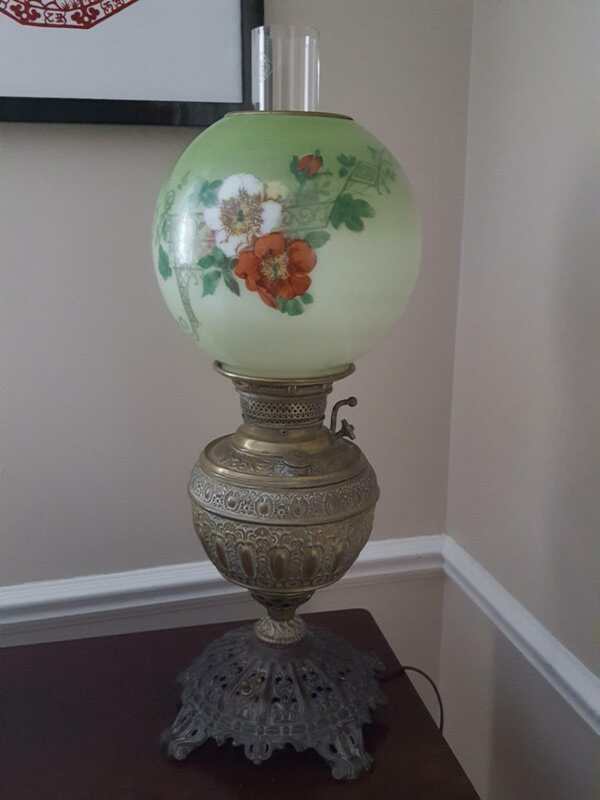 I ordered a YWX ( https://www.gearbest.com/globe-bulbs/pp_728973.html ) flame bulb and put it in an electric lantern fixture from walmart. My wife who originally thought “why bother” now loves it. Very smooth and the “lantern” showcases it perfectly. I went there looking for a second lamp for my other bulb. This kind of store will lots of lamps at very cheap prices, probably one of the best places to look. Other stores similar to The Goodwill Store is the Salvation Army Store and ReStore. Other places to look could be “Thrift Shops” Consignment Shops, Used Furniture Stores, Antique Stores, etc. etc. By posting this I’m just trying throw out some ideas. Anyway, in the back of this store I came across all of these lights. What I was kind of looking for jumped right out. The one to the left of this one isn’t a lamp, but rather a candlestick holder. If it wasn’t for the center one I would have grabbed it and converted it into a lamp. Easier to buy the one already set up though. And the price was only $5! The light output is not diminished that much, and I could still see the flame effect through the frosted glass. I wish I had a way to shoot video that recorded more closely what I see. Here are 2 very short YouTube videos using a clear chimney and the frosted chimney. In my case the individual LED’s can’t be seen with either clear or frosted. What can be a problem with these bulbs other than some do show the individual LED’s, and that for some of us, we get too picky. Neither is absolutely optimal, but both are quite good enough! Bottom line, if one received a bulb that shows the LED’s, use a frosted globe and be HAPPY. Cool looking flame lights. 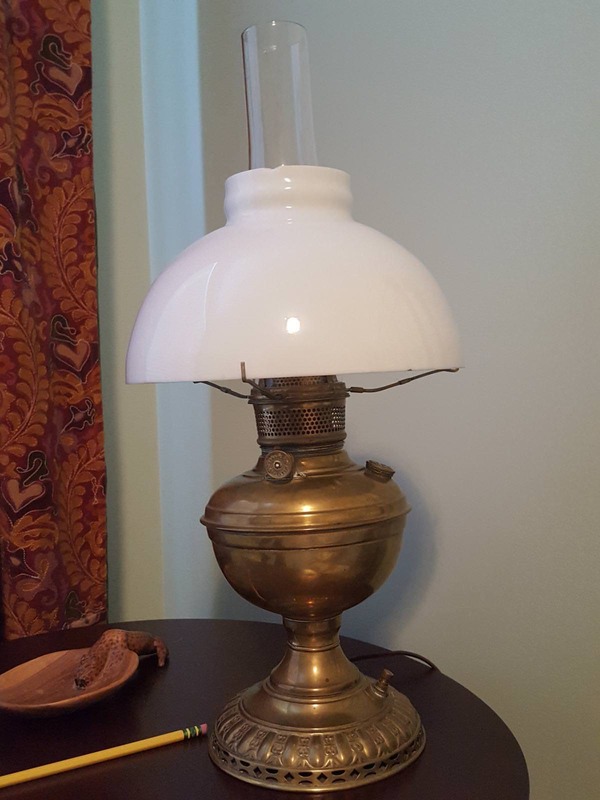 I have several oil lamps from the 1800’s that were converted to electric. They belonged to my Great Grandparents and possibly their parents. Those flame bulbs might give these a nice effect. They had permanently lit LEDs and silk cloth that moved because a fan was blowing! Sounds ridiculous but it didn’t look half-bad at all, guess we are now in the generation where LEDs have improved this product line. ps Happy New Year to our OZ & some Asian members, you guys are already in 2018. There are lots of other ways to get that “Flame” effect. Here is one that uses LED technology, depending…….